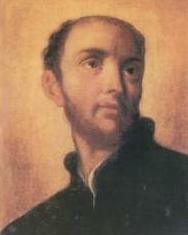 Antonio Maria Zaccaria was born at Cremona in northern Italy. At first he studied medicine, but while working among the poor in Cremona, he felt called to the religious life and became a secular priest. His zeal, moulded on that of St. Paul, knew no bounds. In 1530 Antonio Maria founded the Congregation of Clerics Regular under the patronage of St. Paul, called Barnabites from their headquarters at the church of St. Barnabas in Milan. The congregation was approved in 1533 by Pope Clement VII. While on a peace mission, Antonio Maria became ill and died at his mother's house as a result of his unceasing apostolic toil. He was canonized in 1897 and is celebrated on July 5th.